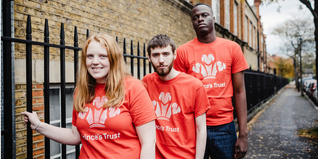 Their Royal Highnesses The Prince of Wales and The Duchess of Cornwall will attend ITV’s 'We Are Most Amused and Amazed', in aid of The Prince’s Trust and in celebration of His Royal Highness’s 70th Birthday, at the London Palladium on 22nd October 2018. This one-off event, which will air on ITV, 13th November at 8pm, will not only see a cast of comedy giants take to the stage, but will also showcase the best jaw-dropping illusions from the greatest magicians in the business. 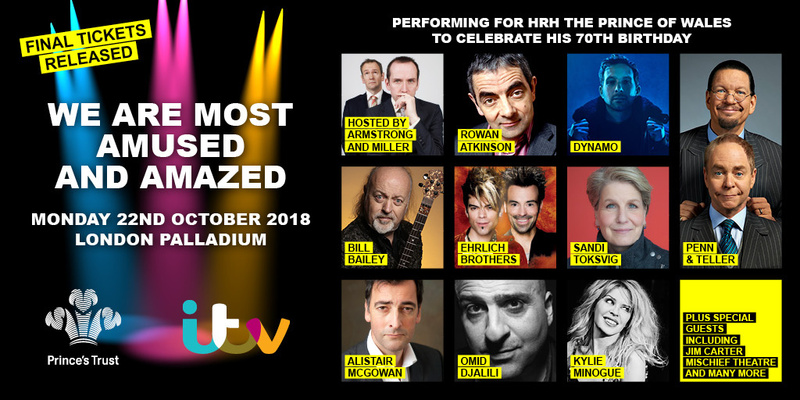 We Are Most Amused and Amazed boasts a stellar line-up including Rowan Atkinson, Bill Bailey, Omid Djalili, Sandi Toksvig, Alistair McGowan and Mischief Theatre, with magicians Dynamo, Penn & Teller and The Ehrlich Brothers also confirmed to perform. The show will be reuniting comedians Alexander Armstrong and Ben Miller (Armstrong & Miller) as hosts of the two-hour event and there will be special appearances from Kylie Minogue and Downton Abbey’s Jim Carter. 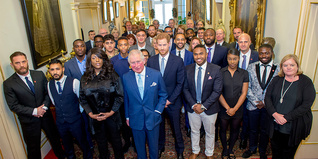 Staged by ITV Studios Entertainment and Spun Gold TV, this gala event promises to be a unique and unforgettable night where the greatest comics join forces with the most accomplished of magicians to celebrate The Prince of Wales' milestone birthday. This special has been commissioned by ITV’s Commissioning Editor Asif Zubairy. We Are Most Amused and Amazed is an ITV Studios Entertainment and Spun Gold TV co-production. Executive Producers for ITV are Sue Andrew and Lee Connolly with Nick Bullen Executive Producing for Spun Gold – the same team which produced the BAFTA-winning The Queen’s 90th Birthday Celebration. Catch the show on ITV, Tuesday 13th November 2018 at 8pm-10pm. 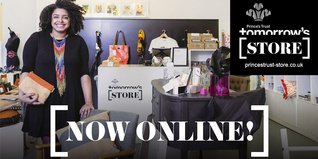 Shop on our new Tomorrow's Store!